At least three times during Yahoo! 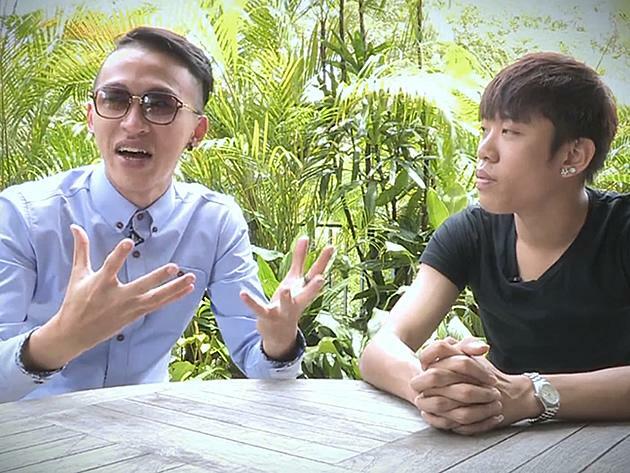 Singapore’s hour-long interview with Ah Boys To Men stars Tosh Zhang and Wang Wei Liang, the boys said they felt like they were living a life that lay beyond even their wildest dreams. And it isn’t hard to see why, given the runaway success that the twin movies have enjoyed not only in Singapore but also in Malaysia, Taiwan and soon, the Philippines. In Singapore, Ah Boys Part One, followed quickly by Part Two, broke the local all-time box office record for ticket sales. Part Two chalked up more than S$6.3 million, and more than S$1.2 million in its first weekend alone. 25-year-old Wang, a secondary 2 dropout who was told by his principal “I don’t need students like you in my school”, has gone from everything-salesman to getai singer — also protégé to the famous Wang Lei, no less — and now movie star. In the well-loved films, he plays “Lobang King”, a witty, law-flouting and street smart recruit who rallies his fellow bunkmates in section 2 — a role noticed and lauded by many reviewers and one he says is pretty much just like him. Zhang, in the meantime, who turns 24 this year, plays Sergeant Alex Ong, a strict, sarcastic but kind-hearted leader who is in charge of Lobang and several other recruits who form the lead cast in the show. Zhang’s prior work ranged from freelance videographer and editor to engaging in the occasional rant on YouTube. He was a week away from flying to Melbourne to start a film course at Deakin University when he got wind of his lucky career break. How Wang and Zhang — both acting debutants -- landed their roles were both amusingly accidental, with Wang being unknowingly driven to the audition by Wang Lei, and Zhang alerted to being mentioned by series director Jack Neo in an open call video for the movie by one of his YouTube followers. “Then I saw the video and I was shocked that Jack Neo even knew about me,” he said. “So I just told my mum, ‘eh Ma, I want to try this one out’ and she’s like ‘You can act meh? You are some jian jie…’” he added, laughing. Together, the two and fellow stars including Joshua Tan, Maxi Lim, Noah Yap and Ridwan Azman were catapulted to fame through 70 days of toiling together, building camaraderie and becoming the unlikeliest set of “brothers” one might come across. The world — or at least East Asia, to begin with — is now seemingly their proverbial oyster, and the boys are not only working on Ah Boys To Men part 3, cutting an original album with songs written and composed by Zhang, but are even involved in a new, non-army-themed film to be released between parts 2 and 3. When this reporter met them, the likeable twosome talked about what they’re working on now, what it’s like to be so famous, what their real NS experience was like, on girls, ah bengs, lobangs and even gave us a taste of Wang’s getai singing and Zhang’s B-boy moves. Because we enjoyed getting to know Tosh and Wei Liang so much, we thought it would be best to bring different aspects of our interview with them to you in bite-sized portions, starting with the boys’ thoughts on what Part 3 should, or could possibly, be like.